WHSmith, Marks & Spencer, Subway and Greggs have all agreed to cut the proportion of sugary drinks they sell in their hospital shops in England. NHS England has asked all retailers with hospital outlets to limit the drinks to no more than 10% of the total beverages they sell by next April. 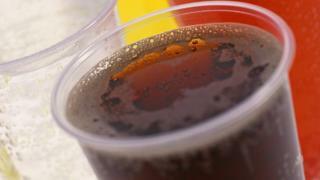 Companies that do not comply will face a total ban on selling sugary drinks in hospital shops. Campaigners welcomed the move to limit sugar intake in hospitals. Retailers have been asked to cut sales of drinks such as fruit juices with added sugar and coffees with sugar syrup and NHS England will ask them to provide sales figures to check on progress. All retailers in hospitals in England are being urged to make the changes to their stock. The plans are part of a health drive to cut obesity and tooth decay across the country. Analysis: Can we trust the sugar industry? NHS England said progress had already been made this year to remove all price promotions on sugary drinks and junk food sold in hospitals and to make sure healthy food options were available at all times for patients and staff. Over the next 12 months, NHS England now wants hospitals to stock a healthier range of sweets and confectionery and more low-fat and low-calorie pre-packed sandwiches. Simon Stevens, chief executive of NHS England, said: "A spoonful of sugar may help the medicine go down but spoonfuls of added sugar day in, day out mean serious health problems. "The NHS is in a great position to take action on the damage being caused by poor diet to the nation's health and the wider healthcare system. "With more money spent each year on the treatment of obesity and diabetes than on the police, fire service and judicial system combined, urgent action is needed." Katherine Button, Campaign for Better Hospital Food co-ordinator, said she was delighted by the move. "NHS hospitals are trusted by patients, families and staff to keep them fit and well and NHS England is helping everyone to take a big healthy step in the right direction." Chris Askew, chief executive of Diabetes UK, said it was great news that NHS England was "taking this step to make hospitals healthier places for all of us". He added: "With this plan, people with type 1 diabetes should still have access to products that are commonly used to treat hypos." But Gavin Partington, from the British Soft Drinks Association, said that while sugar intake from soft drinks had been falling, obesity levels had been increasing. "It makes sense to promote sales of healthier options in hospitals but not to focus on soft drinks, the only food and drink category which has seen a significant reduction in consumer sugar intake, down by over 18% since 2012."